We've been reliving the same events over and over again. We keep getting excited for an original science fiction movie, like Elyisum. Or Oblivion. Only to be disappointed. Which is why Edge of Tomorrow is such a thrill. At last, Tom Cruise has broken the cycle of drek. This is the first movie in ages that does scifi action right. 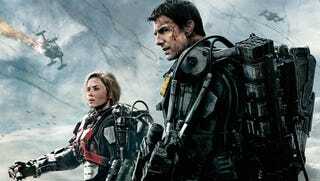 The reasons why Edge of Tomorrow works when, say, Oblivion, fell flat are many: The first is that it doesn't overreach. Edge of Tomorrow is a scifi action movie that isn't trying to blow your mind with some crazy but inevitably obvious twist; it wants to entertain, and it does a great job. It also uses its scifi conceit well; once it's established Tom Cruise's character is going to relive his first battle over and over again, the movie explores the actual ramifications of it, most entertainingly when Emily Blunt — the badass soldier who knows what is actually happening to Cruise — knows the quickest way to get through setbacks in Cruise's training is to kill him, which she does… over and over again. But what makes Edge of Tomorrow work so well is that it actually gives Tom Cruise a chance to act. That's not a sentence you read very much, and no one's going to confuse Tom Cruise with Daniel Day-Lewis any time soon, but EoT pits the star as a complete coward, the last person who should be put on the front lines against a terrifying alien invasion. It's not a Cruise we've seen before, but one he adopts with gusto, and the results are marvelous. Even as he tries to figure out the best way to fight, it's a matter of his own survival, not heroism. Of course, it wouldn't be a Tom Cruise movie if that didn't change over time, but it's a change that's well-paced and earned. My point is that we've seen Tom Cruise in dozens of movies, and this is one of the first times it doesn't feel like he's playing Tom Cruise, and it's extremely entertaining. Director Doug Liman (The Bourne Identity) is also to be commended; he keeps the action excellently paced, so that even the film's few slower scenes feel like they're momentary lulls in the action as opposed to screeching halts. But it's the editing that genius. IMDB lists the editor as James Herbert, so that's who I'm giving the credit — Herbert cuts the footage of Cruise's unending day like a maestro, sometimes speeding up, some times slowing down, but always in a way that keeps the audience knowing what is going on and where (and more importantly when) it's happening. But before the end, the film uses the potential confusion to great effect, revealing the Cruise has lived through several scenarios that other characters — and the audience — are only seeing for the first time. Edge of Tomorrow is by no means a perfect film. Having read the original novel All You Need Is Kill by Hiroshi Sakurazaka, I can tell you there are a few ways the original story has been rearranged to make the scifi more comprehensible, and the plot a more traditional Hollywood summer movie narrative. But the improvements outweigh the disappointments by a considerable margin, not least of which is the humanity that Cruise and Emily Blunt bring to their roles. Really, my biggest problem with the movie is that it chose the dull, unlovable title Edge of Tomorrow over the incomprehensible but unforgettable All You Need Is Kill. If I may reiterate what my esteemed colleague Meredith said a few weeks ago, you will have a damned good time watching Edge of Tomorrow. It's not brilliant or game-changing, but it's exciting and fun and clever without being full of itself. And sometimes, that's all you need (you know, other than "kill").